80 Minutes of Regulation: That Ship has Sailed... Or Has It? In less than a half hour, the calendar rolls over into July, and with it, the final pegs of realignment related to college football at the FBS level fall into place. Navy football will join the American Athletic Conference, completing the conference and leading to the inaugural conference championship game at the end of the season. Navy will compete in the Western division; while it's the geographical odd school out, I suppose if anyone should be misaligned, it should be the one that has their own planes. Selfishly, given my ties to Maryland, I look forward to USF playing in Annapolis with some frequency, though I'll miss this year's match - it takes place on Halloween and I have young kids. Further, it's sandwiched in between Eagles at Panthers and USF at East Carolina, both of which I'll be attending, making it an even tougher sell. A few states south, Charlotte will be taking the step up into FBS as a full member of Conference USA. Interestingly enough, I last knew them as conferencemates in C-USA during my time at USF. 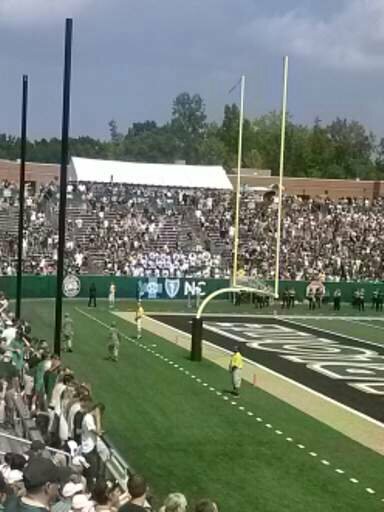 Just as importantly, the 49ers will be fielding a marching band for the first time, a move intentionally delayed for FBS from their start as a program two seasons ago. The Pride of Niner Nation will hold their first band camp just over two months from now, stepping off in September as the Niners start their home slate. With those two pieces falling into place, realignment has cooled down... or has it? Oklahoma president David Boren recently spoke up about the potential for the Big 12 to add two teams to return to 12, and naturally, as offseason frenzies go, everyone started dusting off their resumes. The American, left out in the cold from the power conferences with the latest round of realignment, seems the most anxious, with Memphis, UConn, Cincinnati, USF, and C. Florida all being names batted around, along with western powers like BYU and Boise State. We may soon learn if the carousel is up for another ride.